Live casinos are a hugely popular part of UK casino sites, bringing the challenge of taking on a real life dealer to your computer or mobile device. As such, games developers are looking for new and exciting twists on traditional games. Evolution Gaming has done just that with Lightning Roulette, the company’s new live casino game release. Roulette is a staple of online casino sites, real life venues and live casinos across the world, but this has something extra. Every time the dealer sets that ball in motion and the bets close, some of the numbers come to life and offer multipliers of up to 500x your stake. If you love roulette, this takes it to another level, but if you don’t like the usual game, this could be the live casino game that brings you into the fold. Try it now at Mr Green Casino. As with any normal game of roulette, you try to guess where the ball will land in a numbered wheel. You can bet on the exact number, bet on two adjacent numbers, four adjacent numbers or on a wider section of numbers. For instance, you could choose between it landing on a red or black number, an odd or even number, and so on. You potential prize is larger, the more specific your bet. On Lightning Roulette, the payout for guessing and matching one number is 30x your stake, whereas guessing red correctly is worth 1:1. In other words, you get your stake back and an amount worth the same as your stake in prize money. If you want to know more about the rules of roulette, see the How to Play Roulette page on SpinCazino. The version in this new live casino game is European roulette. The difference with Lightning Roulette is the fact that the wheel electrifies and brings gigantic multipliers if you’re lucky. A random number generator kicks in once the dealer sets the ball in motion and closes the betting. On each spin there can be between one and five Lucky Numbers, with multipliers ranging from 50x your stake to an absolutely mind boggling 500x. If you placed a straight up bet on one of those numbers, you get the boosted payout. This happens every time the ball goes round. You can’t claim the extended prize if you’ve made any other type of bet, but it’s well worth trying to predict the exact number. Roulette is already a magical game, but this goes beyond the usual. The chances to rake in an incredible sum on each spin are very tempting. If you fancy your chances, take part at LeoVegas right now. 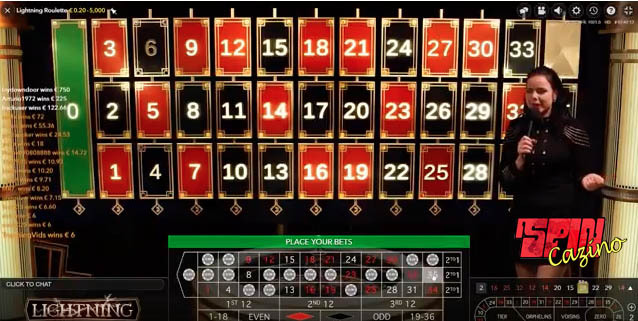 This new live casino game looks like part casino game and part game show. It’s slick, sounds great and looks fantastic. There’s some fantastic art deco styling to the studio and it is a world away from the stilted and grainy images of drab tables that populated the very earliest live casinos. The set lights up, there are impressive graphics all over the place and the dealers are fun and chatty. There’s a bit of banter going on, which is what sets live casino games aside normal online casino table games. If you like the personal touch, this is the way forward for your gaming. The Lucky Numbers appear on a big screen and you can keep track of them on the graphics on the page. If you staked on one of them, it is a thrilling and tense wait to see where the ball lands. This makes this new live casino game even more fun than regular roulette. Evolution Gaming is a big name in a world of live casino play. There are a host of game developers producing titles for UK casino sites, but this company is up thee with the best. They offer regular versions of all the games you would expect, from roulette and blackjack to Caribbean Stud and baccarat. However, they also keep looking to innovate and bring new features to these classic games. The firm prides itself on making a better standard of games, with TV quality live casino streams. It’s no good pointing a cheap webcam at a beaten up green baize table, you need to offer glitz and glamour. That’s exactly what Evolution Gaming does. Check out the review of its version of the money wheel game, Dream Catcher. They also add in lucrative side bets, such as the multipliers in Lightning Roulette. With a flash of light, your numbers could be worth a massive 500x your stake and in some games, multipliers go up to 1,000x. That is a mark of a games maker that wants to push the limits. It’s difficult to go wrong with roulette, but it’s also difficult to do something new. Evolution Gaming has achieved that impressive feat in style. Lightning Roulette is a fun way to spend your time and is the best game our reviewers have seen and creating a genuine heart in mouth moment. It is worth playing just for that occasion on which the number you staked on pops up on the screen. Whatever the multiplier, landing it would be a cause for celebration, but to do so with 500x on the board – that’s the dream. Simply, this new live casino game is a joy. Play Evolution Lightning Roulette right now at LeoVegas and Mr Green Casino.